I get dozens and dozens of emails and messages from you all every week - and many of those emails are asking questions about living a Healthy Lifestyle or tips on how to help family members live a healthier lifestyle. Firstly, there's no such thing as a guide on "How to be Healthy" as each and every one of our bodies is different. I'm not a health professional, but I am someone who lives and loves a healthy lifestyle and have helped many family members and friends to make that switch too. This is why I've decided to launch a series of posts where I'll be sharing some of my healthy living tips. Feel free to leave comments or send me an email with your own questions or suggestions for future posts. To start with, I wanted to share some of my most asked for tips. Tips on how to make that switch to a healthier lifestyle from the lifestyle that yourself or one of your family members are living now - perhaps one that just isn't working for you. Living a Healthy Lifestyle is about more than just what you eat and what exercise you do - it's about having good allover health - that means physical, mental and emotional health. "There is no diet that will do what healthy eating living does" a quote by an anonymous other which is so very true with just one little adaption. Diets are temporary. They tend to send us into a yoyo - we diet, we get sick of the diet and return to our old ways - and before we know it, we're googling the latest diets and jumping back on the band wagon. I think I'm one of the few people I know who has never followed a "diet" and that's because my switch to healthy living came quite early in life. Healthy living is a way of life - it's enjoyable, it makes you happier and it makes you healthier. 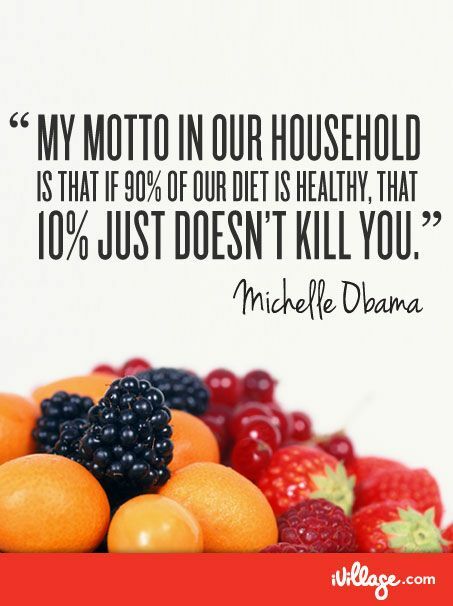 It's a lifestyle of balance - and the quote from Michelle Obama on the right perfectly sums this balance up. When Jesse first started making the change to a healthier lifestyle, he had the diet mentality and it caused problems. As soon as he started to realise that this wasn't a diet, but a lifestyle change - he began to make changes and love those changes. Jesse and I eat healthy food - but we never feel deprived. We eat chocolate cake, we eat pizza, we eat cookies - but we eat healthier versions. Luckily for Jesse, I'm quite the baker and our healthier versions taste even better than the originals. We also enjoy a balanced diet. I love fresh produce and have to watch that I don't eat too much - but I also love chocolate and gelato when I feel like a treat. I probably eat chocolate on a daily basis - but I know how to enjoy it in moderation. Rather than eat a whole block, I'm happy with one or two pieces - and Jesse has learnt the same. Learning to enjoy a balanced diet is key to enjoying a healthy lifestyle. One piece of birthday cake isn't going to kill you - nor is gelato with friends or a glass of wine. 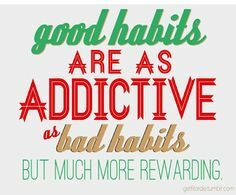 Habits can be hard to break - but if your habits are impacting your health, you need to assess the pro's and con's and realise it's time to change. Smoking - a habit that has absolutely no benefits and something we all know better than to do. Quite possibly one of the hardest legal addictions to give up, but one that can also give us the hardest health problems to deal with. Excessive Drinking - there's nothing wrong with a social glass of wine or a beer with friends but when you drink to excess, you're not doing your body any favours. I don't drink alcohol at all personally, but Jesse likes a beer every now and again and there's nothing wrong with that. Also, remember that alcohol is incredibly high in empty calories - so if your healthy eating and exercise doesn't seem to be working for you, have a think about what you're drinking as that's often the problem. Artificial Sugars - a few years ago my Mum ended up in hospital, in so much pain she needed morphine and doctor's suspected she had instestinal cancer. She didn't have cancer, nor did she have any other medical issue - she was suffering the effects of aspartame. If you ask me, all artificial sugars should be a no-go - and that includes the "natural" artificial sugars like stevia (which has recently been found to cause quite a number of issues in studies). In addition to being artificial and under-studied, these artificial sweeteners can also cause an increased risk of obesity as it leaves us looking for more food to fill the "gaps" that artificial sugars leave as our body is tricked into thinking it's getting energy when indeed it's not. Artificial sugars, particularly stevia, has also been shown to decrease blood levels of the T3 Thyroid Hormone which is linked with weight gain and many other health problems. Put down the soft drinks and skip the iced tea - water should be your primary drink. Our brains are 90% water and our bodies are made up of around 70% water - so water is vital for our bodies to function properly. As with most things, the amount of water you need is actually very different from your best friend and your neighbours - it all depends on your health, your activity, your height/weight and your individual needs. 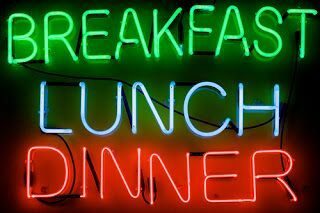 Our individual needs are different - and our schedules are different - however, it's important to eat regularly and often. Smaller more frequent meals are much more beneficial than larger less frequent meals. Do not skip breakfast - it's one of the things everyone tells you, but it's one of the most important. Breakfast wakes up your metabolism and gives you energy for the day. Even if you don't think you need it, you do. If you can't stomach too much in the morning - try something small but energy dense or have a larger mid-morning snack when you're feeling up to it. This works perfectly for me as I'm a grazer and tend to struggle with digestion if I eat larger meals - I also have blood sugar issues so eating regularly helps to maintain my blood sugar levels and avoid crashes and dizziness. Jesse tends to eat the same, minus morning or afternoon tea, depending on where he is and what he's doing during the day. That said - he will combine his snacks with his lunch if he doesn't have time to eat before/after. So you're eating well, you're exercising well - but if you're not sleeping well, I guarantee you're not happy. Studies show that we need about 8 hours sleep - but that number can vary from person to person. Depending on our individual needs, we may actually need more than the recommended 8 hours. You'll know what works best for your body as you'll feel best. Sleep is essential for concentration, productivity, memory and blood pressure and also reduces the risk of depression and heart attacks. We need to be active on a daily basis - not just a couple of times a week. It's important to make time for exercise - but it's also important to realise that we all have different energy needs. I walk almost every day - Jesse will only walk with me on weekends - but that's perfect for each of us. Why? I have what is predominately a desk job. I'm a writer so when I'm working, I'm sitting at my computer. I clean the house and cook, but I spend most of my day sitting. Jesse has an active job where he is on the move most of the day. As I don't need to lose weight and in fact need the opposite, I walk for around 20 minutes a day. In that short amount of time I walk a fair distance - and I walk fast. When I walk with Jesse, we walk for around 40 minutes and we walk a longer distance, but at a slower pace. You need to find what works for your body and what you love - not what's trendy or what so-and-so says you should do. If you're not enjoying it you're not going to do it - and what's the point of that? Happiness works wonders for our overall wellbeing. Surround yourself with people who make you happy, laugh often and smile lots. Find what gives you joy in life and make time for it - it might be the simplest thing that brightens your day. And treats don't always have to be food. Spoil yourself every now and again and see how it brightens your mood. It might be a new lipgloss or a new top that makes you feel gorgeous. Positive things come to positive people - focus on the good things that you have and always be thankful for them. Take a moment each day to be thankful for all that you have - and all that you're yet to have. Good food is food that's good for your body, your mind and your well being. I am passionate about creating healthy food that tastes incredible - and that's what all of the recipes on this blog are. I can't tell you how happy it makes me when I get an email from one of you, thanking me for changing your mind on healthy food as you realise that healthy food can taste INCREDIBLE. You just have to learn how to make it that way. Learn to love fresh produce and enjoy your meals. There's more to life than steamed veggies or raw carrot sticks - so experiment! Toss veggies through your pasta, roast them, grill them - grate them into muffins. If all else fails, try, try again. Portion control is incredible important - you can eat all of the healthy food in the world, but if you're eating too much, you're still going to have a problem. Find what works for your body and realise that we all have different needs. You'll find more food on Jesse's plate than mine - simply because he's a man and he's also bigger than me - but by the same token, that doesn't mean Jesse can eat 24/7 just because "he's a boy". We all have different needs, and likes and interests and looks - we have to find what works for our body. Stop worshipping celebrities or people who you feel have the "ultimate" this or that - because you're not them - nor will you ever be. We need to accept ourselves and we need to love ourselves. So I want you to stop what you're doing, click the comment box and tell me one thing you love about you. For me? I love my eyes - I think they're my best feature and there's nothing wrong with admitting that! Love yourself - that's the only way to love others. That's healthy living in a nut-shell. 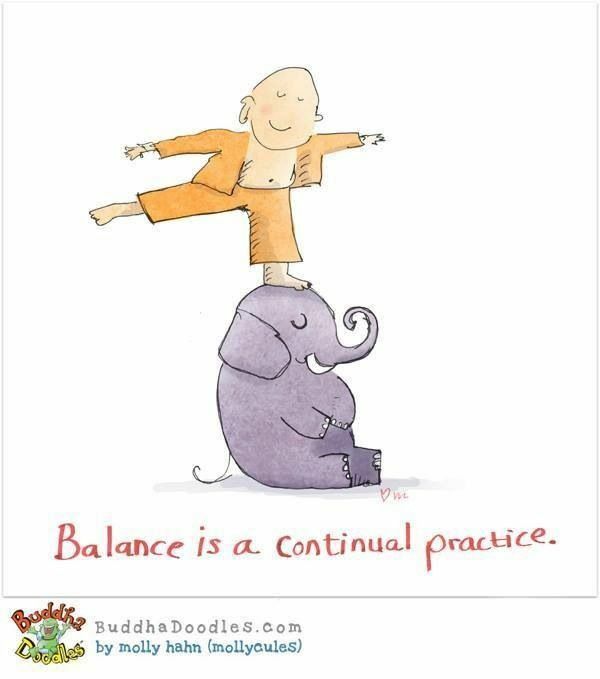 But I do believe it is all about finding balance with your body. Once you notice you are happy and your body is functioning properly then you are on the right track to being the healthiest you can! You are definitely right - and this was what this post is all about. It's all about finding what works best for YOU! My worst unhealthy habits are not getting enough sleep and getting stressed out. Both lead to me eating rubbish as well, which in turn, makes me feel even more rubbish! 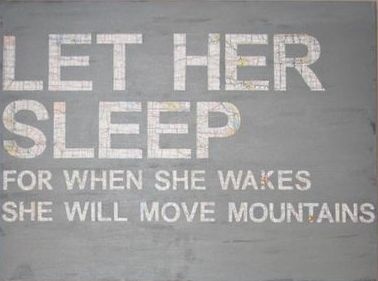 More sleep = a happier, nicer, healthier Mary! I will have to get thinking - do you have any ideas of what you'd like to see? I'm with you - I often get too stressed and forget to stop and take the time to relax. I have such a busy life I forget that sometimes the most important thing is to stop and take some time out for myself. I love that my body allows me to do the things I love- workout, lift weights and teach all my fitness classes to inspire others to love what they do too. Pps. Catching up on all your missed posts atm since I'm back from Europe haha. Love your wedding posts! Hi just found your page and can I say, nice job. My problem is that I want to eat healthy but I have no energy to cook and then clean up after so I find myself buying all the right ingredients from the fresh produce section at Coles or Woolies which don't last to long anymore but I can't get my head around it and end up going back to the frozen Mc cane meals that are simply meat and 3veg. I want to stop the waste, I want to go back to cooking again but another thing is I am still used to cooking for my family (parents and sis) but now it's just me and getting my head around the ratio adjustment is a struggle and I'm not talking about maths. When I have cooked something it has said it's ment to take 30mins, it would take me 4hrs. I don't have a dishwasher so I either have everything pile up or I just use plastic. I want out of this rut. If you or anyone has some real solutions and or tips I would love them. I want that happiness back. I want my old self back. I sometimes find actual people who have lived life know stuff doctors don't and your page made me smile and ferl so hopefully hence my questions. I hope this is ok. Sorry if its not. First of all - thank you for taking the time to leave a comment! I promise you that every recipe on Southern In-Law is quick and easy - unless it says otherwise. I cook all of my meals and make everything that I eat due to my food allergies/intolerances - and the last thing I want to do is spend hours in the kitchen when I'm so busy. A lot of the recipes on Southern In-Law are single portions as Jesse and I often eat different things (as he has no allergies whatsoever) and they're often one pot meals to save on cleaning up. - Set aside some time each week or a couple of times a week to prepare some things. If you're finding you're not eating fruit/vegetables/grains because you don't have the energy to cook or prepare them take some time to do so. It might be as simple as washing apples/berries ready to eat, slicing carrots, washing lettuce/spinach so you can add it to things or cooking some rice/quinoa/pasta and keeping it in the fridge or freezer for a quick addition to meals. - Remember than frozen fruit/vegetables are better than no fruit/vegetables. Often times, readers tell me that they don't eat vegetables because they don't want them to go to waste - but they won't buy frozen veggies because they're "bad". There's nothing wrong with frozen veggies as they are simply just that - vegetables that have been prepared and frozen for convenience. It's better to eat frozen vegetables than none at all. - Take shortcuts and remember that a healthy meal doesn't have to take forever. Some of my favourite quick dinners simply involve cooking some chicken and mixing it with cooked brown rice, a sprinkle of cheese, spinach and mashed avocado - one of Jesse's favourite quick meals is a chicken stir fry (get the recipe here http://www.southerninlaw.com/2013/04/asian-noodle-stir-fry-recipe-tahini-soy-sauce.html) that is so quick to make - and even quicker if you make the noodles/grain in advance. And if it's the dishes that are the problem - use plastic! - One of my other tips is to make entire meals in advance - we always have cheesy quinoa bakes, spinach and feta bakes, breakfast bakes and healthy muffins and baked goods in the freezer for meals/snacks when we don't have the time to make something. We make big batches when we're having them for dinner and freeze the rest. There's nothing wrong with that, unless you're worried about wasting money on throwing them out. 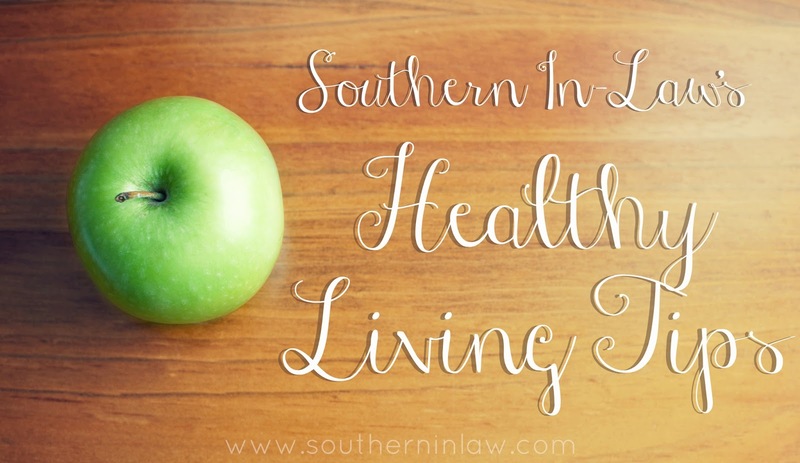 Now, if there's anything more you'd like to know - please don't hesitate to send me an email at southerninlaw@gmail.com or leave a comment on the blog. Have a look through the recipes section and I'm sure you'll be able to find some recipes to inspire you - and if there's something we haven't added that you'd love a recipe for - just ask! I've been having a lot of muesli but I've found that the fruit in it has been making my headaches and migraines worse. I wanted to make muesli bars on my own but didn't know where to start but now it looks like I'm going to have to make the whole lot on my own. Do you know what sulfates are and why they are in dressings, soup, muesli, etc? Like MSG they seem to make my head go BooM! It is a vicious circle like someone said earlier. and there starts the outer bad cycle again. Could you possibly put up how to shop for one, two, three or four people when it comes to produce. It is very confusing especially when you don't want to waste and are watching the $. I know you can look at a recipe but I'm talking week or fortnightly shop. I think that and tips to make things last longer especially if Aus is really going to have as hot of a summer as they are predicting we will need all of those tips or things will be off before we even pay for them. I'm allergic to sulphates so I totally understand your struggles. Sulphates/sulfites are a preservative that's used in food or drinks to preserve flavour/colour/texture, inhibit bacterial growth, reduce spoilage, prevent fresh food from browning/spotting and increase shelf life. They're also a common allergy - hence why they're listed on labels. You can buy dried fruits that don't have sulphates, you just need to check the labels. You'll find that most dried apple, apricots/peaches/pears and coconut have sulphates added, unless you buy unsulphured or organic versions from a health food store. As for produce, it's hard to tell how much to buy as it really depends on how much you eat. I eat a lot of fresh produce so for me, I'd be buying 1-2 kg of carrots, 1 kg of cucumber, 1kg of zucchini, a whole pumpkin, 2-3 kg of apples, 1/2 kg of blueberries, 7-10 bananas, a few potatoes/sweet potatoes and about 1/2-1 kg of spinach per week plus any extra veggies I'd pick up during the week. talking week or fortnightly shop. I think that and tips to make things last longer especially if Aus is really going to have as hot of a summer as they are predicting we will need all of those tips or things will be off before we even pay for them. For Jesse it would probably be around 8-10 bananas, 7 apples, 3 capsicum, 1kg carrots, 1/2 kg spinach, a couple of bunches of broccolini, about 5 tomatoes, 4 corn cobs, a couple of potatoes/sweet potatoes. As for making things last longer, try buying in smaller quantities more frequently. Root vegetables like potatoes, pumpkin, sweet potatoes and onions last a long time so you can buy them in larger amounts but things like spinach wilt, bananas go brown (and brown faster when it's hotter), tomatoes soften etc. When you're buying at a per kilo price, it doesn't matter if you buy a small amount or a large amount. Now everyone is so busy into their hectic schedule, not even time to interact and talk to other. Mostly seen that everyone is busy to reach on top, that is why we doesn’t even look into our life. 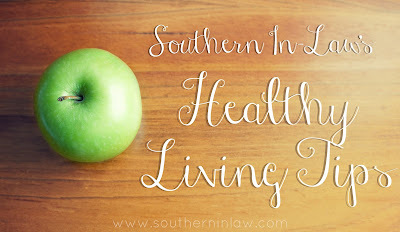 A healthier life is not only eating good, sleeping and all that stuff. Its all about how we live. A properly manage life also a way to live healthier. To live healthier one important thing we have to do is "Change the way we think", its time to change our thinking. Be optimistic and positive in life. Treat your body as temple a healthy mind is a key to success. Love your life because life is short, and we all need to step back and realize how great it really can be. Thanks for sharing your beautiful view on healthier life.